The original insurance coffee house exchange was, even back then, a tried and trusted way of doing business and it put London at the heart of the global (re)insurance market for over 300 years. But it is now clear that a new, more efficient and technology driven insurance exchange is needed. To be fit for the future, a new exchange can now become distributed and virtual in nature across the trading participants. It will remove the outdated, costly, manual processes associated with placing risks, accounting and handling claims. It will equip businesses to move on from the monolithic centralised administration infrastructures that have been used elsewhere and have been shown to be inflexible and expensive to operate and maintain. Bermuda’s reputation for innovation, its sophisticated business environment and its progressive regulatory framework, makes it the prime location for the new exchange. The technology behind the exchange will not only reduce frictional costs and reduce time frames but will also increase market access for those wanting to insure and for those seeking to provide capital. It will enable the existing market participant businesses, brokers and risk carriers, to develop and market new competitive products and extend their distribution reach like never before. Bermuda is already a major market in the global insurance industry and an acknowledged leader in reinsurance and ILS capital products. Capability and capacity from Bermuda have already brought innovation and driven change across the global insurance business. Bermuda's scale, geographical position and entrepreneurial spirit will enable local businesses to capitalise on all the operational advantages the new exchange provides. Adding an efficient trading capability through the Bermuda Exchange will accelerate this position and make Bermuda more attractive still. timely and accurate data also allows every business to better analyse it to improve decision making and risk management practices. The exchange has been designed to co-ordinate and automate all the same processes that are currently performed manually within each trading business. It connects in to all existing insurance IT systems, bringing new efficiencies to the business processes that fit between participants but are not supported by existing technologies and existing internal administration systems. All the checks and controls that ensure the insurance contract is executed properly across all parties have been built into the technology using ACORD data standards and have been thoroughly reviewed by insurance leaders and markets around the world. It’s a complete, decentralised market, ready for 2019. The contracts that are placed on the exchange are always live, meaning they contain the latest negotiated, agreed and updated terms and coverages. All prior versions are visible within the contract’s history, with all comments, queries and supplementary documents. This ensures that every counterparty has access to and can view all the information, providing all with absolute contract certainty. This route to administering business reduces, perhaps eliminates, E&O risk and speeds up decision making from renewal processing through to claims management. The exchange makes it easy for the Bermudian insurance market to work with other global insurers and for Bermudian brokers to service and support a wider range client needs wherever they are based, matching their insurance needs with both existing and new sources of capital. This unprecedented ability to match risk with capital will not only increase deal flow through Bermuda but will enable innovative new products to come to market at a rate that the rest of the world will not have the capability or capacity to compete with. Providing the opportunity to both maintain margins while reducing pricing to the insured. In turn, this will increase business performance and global competitiveness. For regulators, the exchange participants can use the DLT held records to provide an assured and guaranteed source of information that will allow them to report in a more effective and easily audited fashion. With the inherent efficiencies in DLT processing, the administrative costs of conducting business will be greatly reduced. Both our own estimates, and those of other market commentators suggests that a DLT exchange could reduce frictional administration costs by up to 30% for every party in the distribution chain. This will dramatically improve expense ratios because the efficiency is realised in insurers own administration costs but also in distributors where such costs form part of the brokerage and distribution charges. The exchange is built on the Corda platform, the gold standard for DLT and one which was built for financial services. The nature of distributed ledger technology, and the platform upon which it is built, means that data is 100% secure and 100% accurate. Each counterparty retains full and entire ownership of their own data. It is encrypted in such a way that it can only be decrypted by them. Trading data is only held by the trading counterparties and trading data is never held by other (i.e. competitor) businesses even in encrypted form. Not even the engineers that built the platform would be able to access a participant’s data. The nature of DLT means that all the data needed for and generated by a transaction is increasingly recorded digitally, giving each participant instant access to their own real-time, accurate data, so that they can make quick, informed decisions. This achieves an improvement in data quality that can also support data analytics and programmatic tools to drive better insights, speed pricing analysis, help businesses to develop their risk management practices and identify the areas of business that are most profitable. 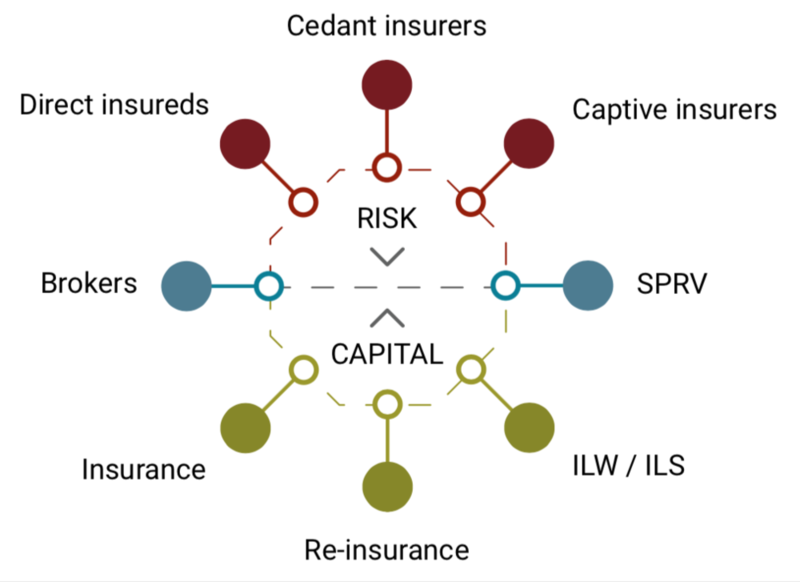 By reducing costs, previously uninsurable risks will become increasingly insurable. With a reduction in time consuming work, the Bermuda Insurance Exchange will enable businesses to develop new products, whether in certain layers or new products, to bridge those uninsured gaps that are attractive to clients. The greater access to potential partners the market provides, means that finding, communicating with and trading with businesses that have an appetite for those products becomes easier too.